This is part one of an interview series with George Ledyard. The interview is a lightly edited transcription of our most popular podcast. Aikido Journal (Josh Gold): Thank you for joining us today Sensei. Before we start taking about ukemi, could you share a bit about your martial arts background first? George Ledyard: Okay. Well, I got started in college. I trained with a Shotokan karate teacher named Tabata Kazumi Sensei who was going all over New England, and he was trying to get Shotokan set up as an intercollegiate sport. When I got out of college, I went to Washington, D.C., and because of a friend, I stumbled onto aikido. He literally was just out walking and saw a sign for a demo and went to see it. I’ve been doing it ever since. You’ve also worked on some initiatives that are not strictly within the realm of traditional aikido. Could you describe those briefly? Aikido has been the number one focus for me, but I’ve done a bunch of cross training, and I think the most influential of it, even though it was fairly brief, was training with Ellis Amdur Sensei doing some koryu [pre-Meiji traditional martial arts]. I learned a great deal about the approach of koryu and the way people train in it, how kata training worked, and so on, and it really affected how I look at aikido, especially when I do aikido weapons work. I’ve also worked on a great deal of police defensive tactics training, and for a while I was doing regular training for law enforcement. I’ve trained with Bruce Bookman Sensei in iaido as well as aikido. The Aiki Expo also put me in touch with some teachers like Toby Threadgill Sensei, Chuck Clark Sensei, and Ushiro Kenji, a karate teacher from Japan. These people have really changed my whole outlook on aikido. So, there’ve been a lot of stages to my practice. Fascinating. Let’s talk a little bit about the role of the uke in aikido. You have some pretty interesting thoughts on this topic and I’d like to share that with the Aikido Journal community. First, I’ll speak to the experiences that have strongly influenced my opinion. I did a fair amount of systema [a Russian martial art] for a while, and their methodology for teaching and learning made more sense to me than a lot of the way aikido people tend to try to do things. I think the single most important thing I came away with from systema was that they don’t want to train to do anything that they don’t want in the final product. Applying that to aikido, if your goal is to have a relaxed mind in a relaxed body and to be using aiki to its fullest extent, you should not be training and doing thousands of repetitions in something that doesn’t produce that. Additionally, if there’s excessive tension, fear, and/or pain during training, it’s all counterproductive to the end result. And that got me thinking about the role of uke because in contemporary partner training, the nage is trying to do this very sophisticated, relaxed aiki with a partner who sort of acts like a prop to provide resistance, not like a good martial artist should move. The uke is using their body completely differently from nage. However, if the goal is to be able to execute aikido techniques someday to handle somebody regardless of whether they’re resistant or not, it’s a really bad way to train. It’s very much like if you were learning how to drive and the instructor tells you to put the car in gear, but then every time you tried to drive the instructor hits the brake. You don’t learn to do something by not doing it. Then there’s Daito Ryu. I’ve done a few years now of Daito Ryu training under Howard Popkin Sensei and Joe Brogna Sensei, and we have a study group at our Aikido Eastside dojo that is actually run by some of my students. The methodology really struck me, because there’s a high percentage of static physical connection work that’s designed to program your body-mind to have the proper habits. The percentage of that at the beginning of the training is much, much, much higher than aikido. When I started in aikido, I walked into Saotome Sensei’s dojo back in 1977 and these black belts got me a gi and they showed me how to tie it and put me right on the mat. I bowed in and then partnered up and suddenly I was doing yokomenuchi shihonage ura. It was like throwing the baby into the pool to see if he can swim. Now, I loved it, so I put up with the bruising and the bashing because, you know, there was no beginner class. If you jumped in and you could keep up, that was great. But I have come to think over time that for most beginners it’s an inappropriate approach because it’s intimidating and it’s not the shortest way to learn the most important skills. And I have to say that the Daito Ryu people are better at getting those skills up front, which I think is one of the reasons why all of the 1930s aikido senseis are sort of legendary figures — they trained differently than the postwar people did. So, in our aikido, in my teaching, I’m trying to put a lot of that static connection work back in. Here’s what I think about the role of uke. Uke should not be doing anything different than nage. 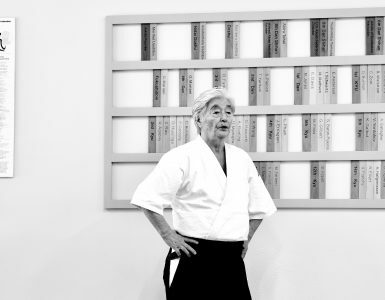 Fifty percent of your training in your aikido practice is in one role or the other. If you are doing different things in different roles, then your body and your mind just get confused. You’re not imprinting the same mindset and movements over and over again — you’re switching back and forth between what you’re “supposed” to do and something completely different. And that does not develop the proper habits. If the basic premise in partner training is that somebody grabs us and we learned how to join with it and redirect the movement, you should be able to do that as uke and not just as nage. So in our training, katatedori [same-side wrist grab] is not about grabbing somebody and keeping them from moving – no one ever won a fight just by keeping somebody else from moving. You have to be able to do something active to end the encounter. 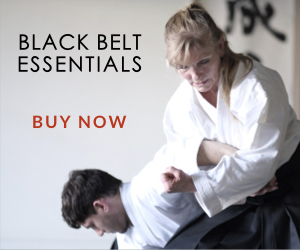 In contemporary partner training, the nage is trying to do this very sophisticated, relaxed aiki with a partner who sort of acts like a prop to provide resistance, not like a good martial artist should move. The uke is using their body completely differently from nage. In katatedori, uke should be able to grab nage and achieve kuzushi [breaking your opponent’s balance]. You’re supposed to be grabbing them, breaking their balance and setting up a strike, where the strike is actually the real attack, not the grab. Generally in modern aikido, we’re training in a very remedial way and people have actually forgotten about what these setup attacks really were. There’s no such thing as an attack where you grab somebody’s shoulder and stand there, and certainly not one where you grab somebody and then try to make yourself difficult to move. Your opponent will just hit you. This whole approach needs to be fixed because we’re not getting the level of skill that students could get from all the time and effort they invest. What we get instead is people who are 20, 30 years in that are athletic and in very good shape aerobically, but everything’s based on muscle power applied against the other person’s weak lines. That might work to a certain extent, but it’s not aiki. 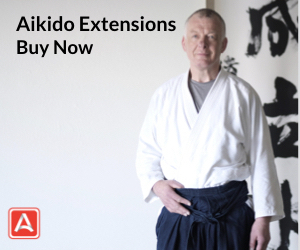 Could you explain a little bit about what using aiki is like? Well, when you’ve had physical contact with somebody who’s got real aiki, it’s just a different proposition. Certainly Saotome Sensei has mystified me over the years because I’m two and a half times his body mass and I would grab him absolutely as hard as I could but he handled me effortlessly. 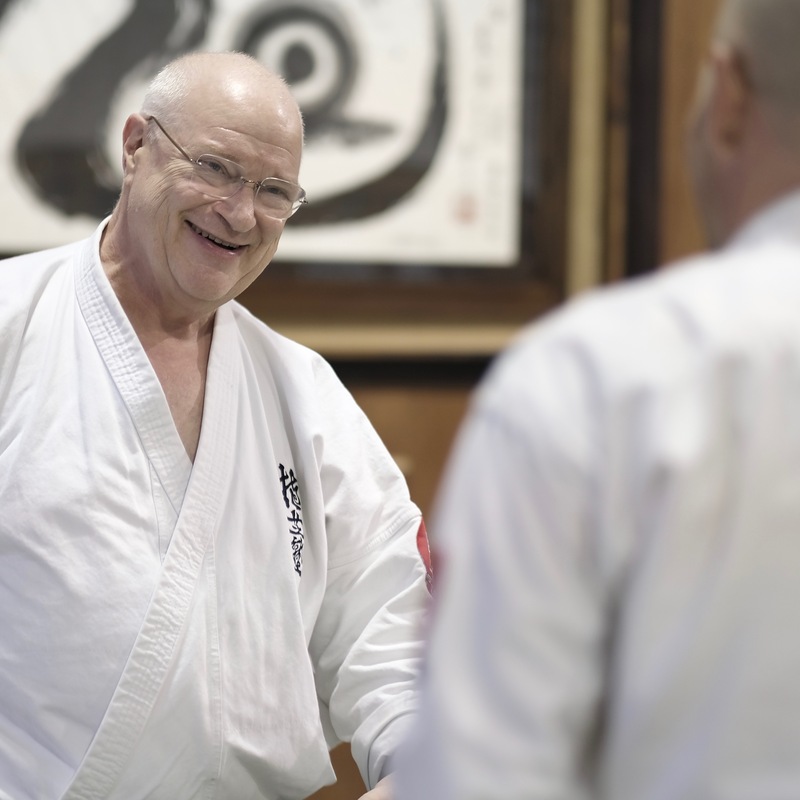 For a long time I thought, “Okay, he’s Japanese and he trained with O-Sensei and he’s special and the rest of us can’t really do this.” But then I met Don Angier Sensei and it was an eye-opener for me because Angier Sensei would drop me on the floor and I never felt anything. No force applied. I simply found myself on the floor. That was when I finally realized that non-Japanese people could do this stuff. Before that, I don’t think I truly believed it. And if we’re going after that, we have to change how we train, and the role of uke‘s a big part of that. In some cases, the uke doesn’t offer real resistance and just goes with whatever the nage does. That may be a very nice blending, moving meditation practice, certainly aerobic exercise, but it is not ever going to result in any kind of martial skill. In a martial art, you are supposed to be able to apply your skills against someone who isn’t cooperating with whatever the technique is that you’re doing. Any ukemi the enemy or the opponent takes in a real situation is not voluntary. They would like to counter you. 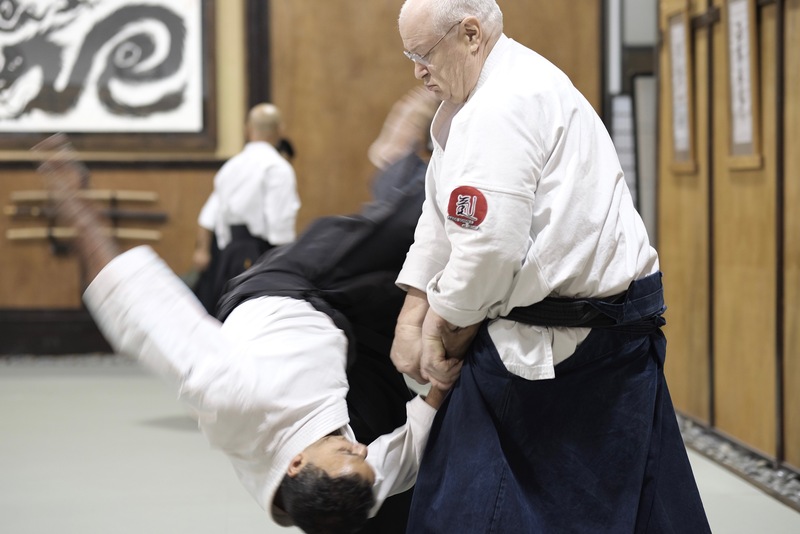 If you are serious about doing aikido as a martial art, then you have to really trust that your partners are not just automatically falling down or tanking. I think this is a concept most practitioners would agree with conceptually, but I don’t see it often manifested in practice. It’s difficult for people to really get this because aiki, the foundation of aikido, exists in between being overly cooperative versus overly resistant. 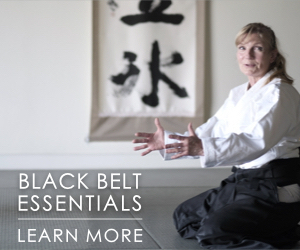 It’s the most powerful concept in aikido, but it’s also hard to understand and master. Developing aiki is about developing an integrated physical and mental structure. You’re using your intent, or the action of your mind, on your connective tissues — your ligaments, tendons, and fascia. One of my internal power teachers, Dan Harden, said that your power is directly related to how much tissue you can recruit for your movement. When the internal power guys talk about this stuff, they say, “When one thing moves, everything moves.” An arm is never moving separately from your foot. Everything is connected. The uke should be practicing that kind of integrated structure just as much as the nage. So, when uke comes in to attack, even if it’s just a static grab for training purposes, it should not be executed with the intention of restraining the nage. The grab should be done with the intention of connecting to nage’s center with their structure. Here’s what I think about the role of uke. Uke should not be doing anything different than nage. Fifty percent of your training in your aikido practice is in one role or the other. If you are doing different things in different roles, then your body and your mind just get confused. You’re not imprinting the same mindset and movements over and over again — you’re switching back and forth between what you’re “supposed” to do and something completely different. When nage attempts to do their movement, if they run into your structure as an uke, you shouldn’t be falling down. The nage should get immediate feedback that they’re running into your structure. And if nage does execute the technique properly, then you take the ukemi. That being said, uke is not there to switch it up on nage or to mess them up. Not at the beginning, anyway. 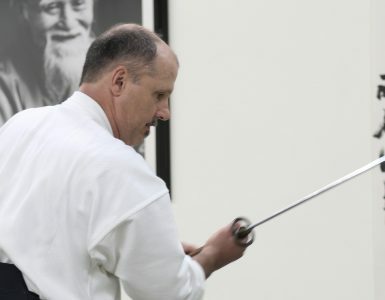 Toby Threadgill Sensei, who’s another Aiki-jitsu and sword teacher that I hugely respect, was saying that a student should not train with anybody trying to be resistant for at least five years. So, you have to spend a lot of years imprinting these skills, and if you are striving for success with someone who’s competing with you too early in your training, you’re going to fall back on muscle power and you’ll never get to a high level of skill. You’ll just get strong physically. And, you know, for me, I want an aikido that I’m going to be better at when I’m 90 than when I’m 30. 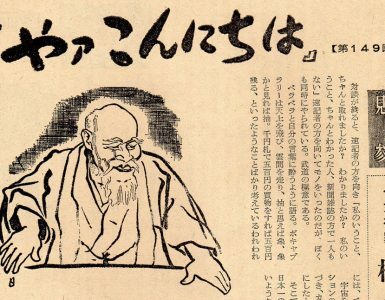 If you read about Sagawa Yukiyoshi, who was a contemporary of O-Sensei and also a student of Takeda Sōkaku, he said that he didn’t really start getting good until after his stroke at age 80. That’s aiki. There’s no limit to how good you can get if you’re pursuing things on that basis. If you are pursuing things on the basis of athleticism, strength, power, muscle power, speed — that’s a young man’s game. It’s very fulfilling if you’re in your 20s, and that’s how I did it. But I think I spent a lot of time and effort training really hard but not intelligently, and I have to spend the last half of my career kind of undoing some of those bad habits that I developed. I go around to different dojos to teach and sometimes there are people who are pretty high-ranked, and when I grab them and they run into the wall they look shocked. I’m not even working at stopping them, I’m just giving them decent structure. It’s quite clear that if you’ve been training for 25 or 30 years and you get surprised when your skills aren’t working like that, it means that you’ve been training with people who have been falling down for you, and that you have not been getting the proper feedback. 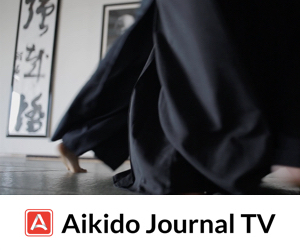 Stay tuned for the next part of this interview and more of Ledyard Sensei’s thoughts on refining the role of uke in aikido. Very nice. It would be nice to get some photos to emphasis what he means. For instance on a shoulder grab technique are you grabbing to simulate uke is pulling you towards them to punch you with the other hand? As always George makes some good points. I think the problem is really the way Aikido has been taught. For instance Uke bends his/her elbow to accommodate for applied torque force etc. Someone sees this and then as Nage bends Uke’s elbow for him/her making the move worthless in the real world off the mat. The now Nage does so because of inadequate teaching and propagates this in future teaching on their part. Hi, I loved this interview with George and agree wholeheartedly with all the points he raises. This may seem an odd observation from someone like me who’s never trained with Saotome. I think it just goes to show that those who train hard for decades end up in the same place, with the same sets of questions and same set of answers. I tried to answer many of these questions in my forthcoming ebook (The Aikido Body) but perhaps went to even greater depth and breadth to answer them. Who is Don Angier Sensei though..? I can’t seem to find any videos online of this man. Great how the martial mind is one that accepts tests of their beliefs. We must always question what we believe to be the correct way to train. Thank you for the time spent in creating such a fantastic educational interview. I have really enjoyed reading these interviews and articles and listening to the podcasts. I’m an aiki-jujitsu/ Jiujitsu practicioner and I studied some aikido in the past. These masters really resonate, and they reinforce so much of what my own Hanshi teaches. Osu. Excellent comments on the role Uke should play and how the feedback given is as important or more than just completing the techniques. I hope the students who strive to get technically better apply these concepts in their training.